The managing editor role has existed since traditional media emerged, however today’s digital editor has evolved into much more than a piece of paper and a red pen. A constant flurry of pitches and eager authors combined with the actual reviewing, editing, formatting, and publishing content makes for a very complex position. And now that content development is such a major part of successful business, the end goal of building a publication filled with wonderful content that their target audience will enjoy and share can be daunting. Editors work hard to offer useful content on a daily basis, but end up spending a lot of their time weeding their way through guest blog pitches that don’t quite hit the mark. So, I’m here today on behalf of every editor to (hopefully) quell any myths about pitching a guest blog post. Try these nine tactics to impress your favorite blog’s editor and get your work published today. 1. Start with the relationship. Cheers from a fellow chronic wanderer, who also made a pit stop in South Florida. While you were pulled away to the Big Apple, I recently settled down in Delray Beach. As a PR and digital marketing enthusiast, I thought you might be interested in the following research on content marketing. She figured out who I was and addressed me by name. This means she went to our About page, scrolled to the bottom, and found me, or she Googled “Convince & Convert guest post guidelines” and found me there. She visited my Twitter profile and used the “chronic wanderer” line from my bio. She visited my About.Me page and saw that I was living in South Florida for a short time and now live in New York City. If you really care about getting your article published, then you must understand that your relationship with the editor is just as important, if not more important, as the quality of your writing. Make me care about you, as a human, and I’ll be much more likely read what you have to say. Between Jay and me, we probably receive over 200 pitches per week. Do we need to publish or even respond to all of them? Absolutely not. We have a cadre of fantastic writers who love to share their ideas, plus we have podcasts, videos, and visual storytelling posts each week. We are not in this publishing business to help our writers; we’re in it to help our readers. Now, I know that generally, our relationship with guest bloggers is mutually beneficial. The blogger gains new followers and possibly even new business while we gain a fresh perspective. But the successful bloggers don’t tell me about their budding business venture and how our exposure can help them. They tell me what value they can bring to our audience. This is an extremely important point to include in the beginning of your pitch. If you can’t prove that you can help us, we certainly can’t help you. This one seems obvious, but sadly, it’s not for everyone. We don’t share a link to our guest post guidelines directly from our homepage. This is intentional. We don’t want to get hundreds of pitches per day. Instead, we want new guest bloggers to come to us from a recommendation of a fellow guest blogger or be able to find our guidelines on their own. But the guest blogging guidelines aren’t necessary for someone who is a consistent reader of our blog. We publish 1-2 times per day five days a week, so readers should be able to get the gist of what kinds of articles work for us without specific guidelines. This is true for any blog, not just this one. 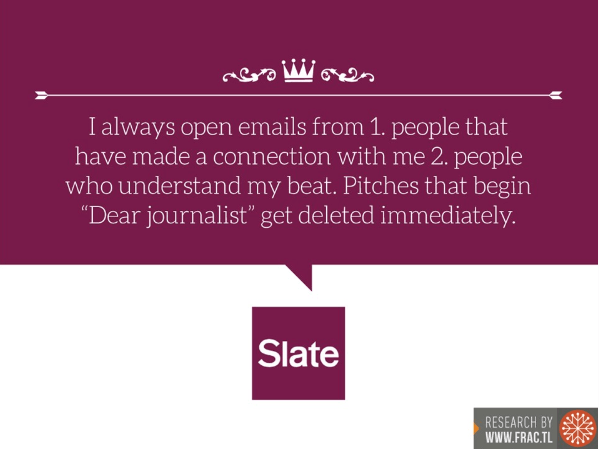 If you truly want to write for someone, don’t send out a blind pitch. Reference the materials on the blog, share admiration for an idea that the blog recently highlighted, and consider playing off of a common topic or writing a follow-up post to a specific article. 4. Subject lines are everything. Just like successful email marketing campaigns, a successful pitch starts with the subject line. If you can’t persuade an editor to open your email, how can you expect her to want to review your post? I open every pitch I receive, but that’s not true for all editors, especially those who manage huge media outlets. 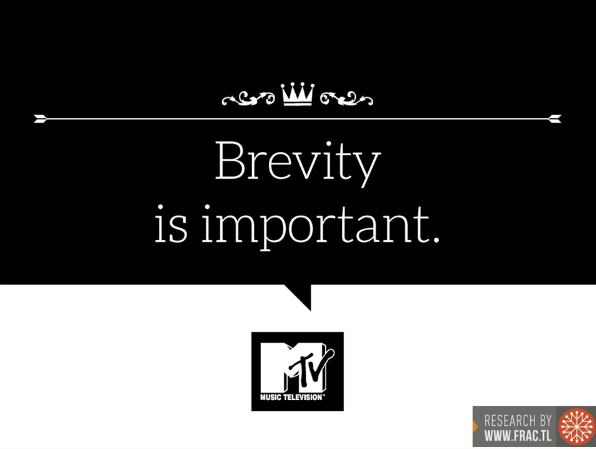 And research shows that 85% of editors open emails based on the subject line. That means you must offer something personal, valuable, or compelling in just a few words. One is specific and provocative, the other is generic and boring. 5. Be understanding and respectful of editors’ time. This one is paramount in developing a good relationship with an editor, which as I explained in the first point, is extremely important. At Convince & Convert, we often have a 2-6 week editorial calendar in place depending on what we have cooking at any particular moment. This means that we are reviewing, editing, and publishing anywhere from 5-30 pieces all the time. That’s typical for many bigger blogs and media outlets. Therefore, don’t expect us to have read, reviewed, and decided on whether your article is right for us in one day. Or even three days. And definitely don’t assume that we’ll be able to run your article right away even if we do like it. My rule of thumb is to give the editor at least one week of review time before following up. Also, assume that your article won’t be published for at least a month. If an editor gets back to you sooner and your article is published the next day, you get to be pleasantly surprised. 6. Write once, edit twice. 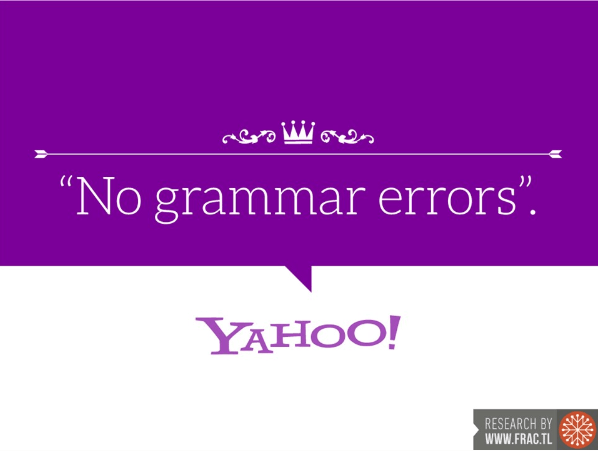 Over 50% of editors are very likely to delete a pitch if it includes spelling and grammar errors, regardless of how good the content is. That’s because if you aren’t paying attention to the quality of your pitch, you likely aren’t paying attention to the quality of your content either. Editors don’t want to be spending all their time fixing grammar and spelling issues in your post – don’t rely on them to do so. Send them a perfectly crafted pitch letter and an immaculate post that they will only need to edit for formatting and the occasional tone/style adjustments. Your editor will love you for it and will want to work with you again in the future. While your subject line may be your chance at a great first impression, the meat of your pitch is what can really make or break it. 7. Offer creative content options. If in doing your research you notice that a particular blog hasn’t covered your particular subject matter of choice, you might think you’re a sure-fire match. But remember that with a long lead time and pipeline of content, it’s possible that the editor may have something in the hopper very similar to what you planned for. Spend some time thinking about topic ideas that you know you could knock out of the park and offer multiple article ideas in your pitch. It will show your editor that you’re versatile in your knowledge and are willing to work with them on the best possible match for their audience. 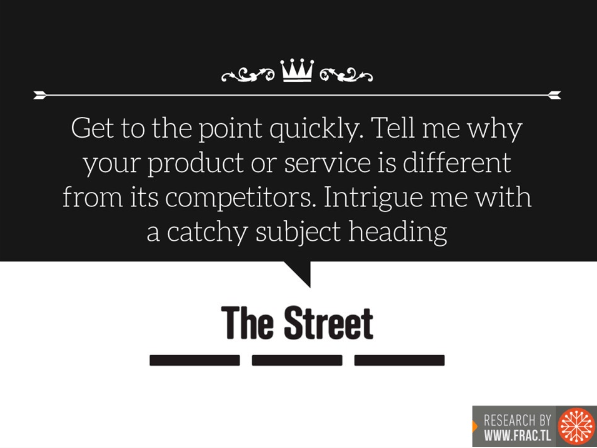 Then, when you settle on a final topic, offer 2-3 title options and visuals. This helps the editor do what he/she does best. Have I made it clear enough that editors are busy? It’s not necessary to send a final draft in the initial pitch. Instead, you can best use your time getting their approval for your ideas and then delivering a draft once you’ve fleshed it out together. We are living in the age of short attention spans and bite-sized content. Including a great visual helps the editor, yes, but it also makes your content more compelling for readers to consume and share. After all, visual content is processed over 60,000 times faster than text and can generate over 94% more views for your post. That’s why we feature a weekly visual column here on Convince & Convert – we believe it’s important to highlight the companies that are getting it right. Our visual expert, Jessica Gioglio, proves that compelling images and videos are the best way to engage an audience and raise awareness. Bonus points for creating your own visuals, not just using stock photography. You can learn about creating your own visuals here. What did I miss? 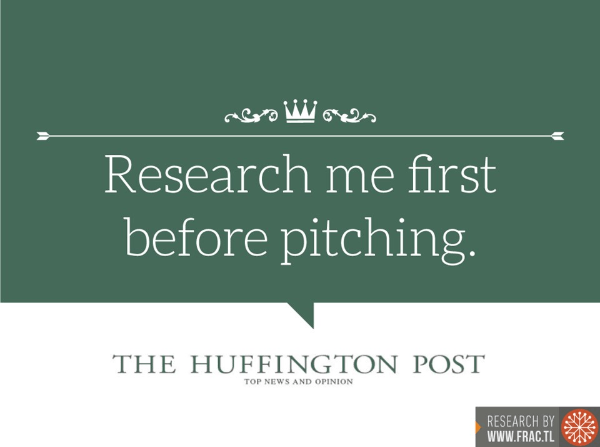 Have you been successful in pitching your guest blog in other ways? Special thank you to Frac.tl for putting together some of the research for this article and pitching it to me in a concise and compelling way. Great work!